It all goes back to the classic. A real old fashioned is hard to find but it is beautiful. Classic recipes call for whiskey, sugar and bitters. Corsair’s quinoa whiskey has delicious coffee and chocolate notes so we’re using coffee bitters to bring those notes forward. Instead of sugar, we’re using maple syrup which provides a delicious richness. To further enhance the maple flavour and add some smokiness we use a Maple wood plank and torch. This cocktail is shockingly delicious and one of favorites. Cheers! Procedure: In a mixing glass add the whiskey, maple syrup and coffee bitters. 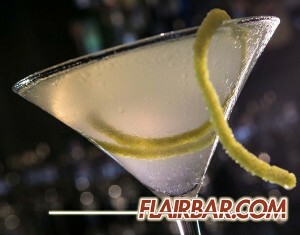 Stir well to incorporate all the ingredients before filling the mixing glass with ice and stirring for 30 seconds. Allow your cocktail to sit in the mixing glass while you smoke a large rocks glass. Take a culinary torch and point it directly at your Maple wood plank (sur la table). Once there is a bright cherry in the wood take your glass and place it upside down over the cherried wood. The flame will extinguish and fill your glass with maple smoke. Turn your glass over, add a single large ice cube. Using a julep strainer, strain your cocktail into the rocks glass over the large cube. 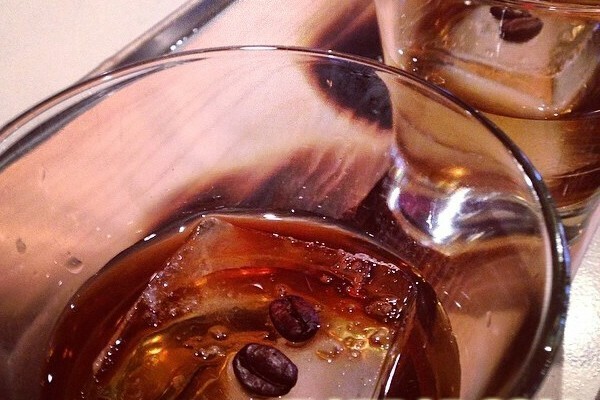 Garnish with two espresso beans and serve. Garnish: With 2 coffee beans. This month is all about classics with a twist. The cloudy and 75 is a riff on a French 75 which is one of my personal favorites. Essentially the French 75 is a gin sour topped with champagne. Here we’ve modified the ingredients to give the cocktail a balanced and smokey taste. 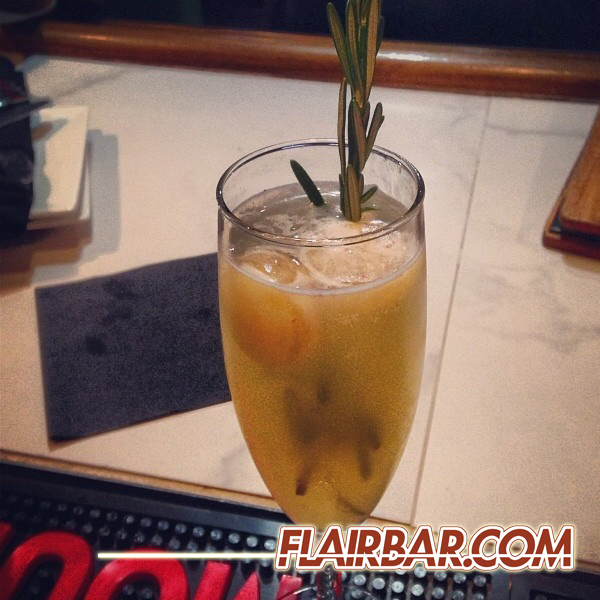 Garnish your cocktail with a fresh rosemary sprig and if you have an ice mold make some small apple ice chips/cubes to top the cocktail with for a visual surprise your guests are sure to love. Procedure: This cocktails’ smokey flavour comes from the burned rosemary and sage syrup. To make your syrup steep 2 cups of boiling hot water with rosemary and sage sprigs that you have torched. Burning the sprigs will release oils and give the syrup a burned flavour. After stepping the herbs for 5 minutes, remove them and add 2 cups sugar to the flavoured water. Blend well and voila: you have your syrup. In a mixing tin add the apple gin, lemon juice, rosemary-sage syrup and apple cider. Fill the mixing tin with ice and shake vigorously into a champagne glass. Top with champagne, garnish and serve. The Aviation is a delicious classic cocktail that when made properly is a bright sky blue. Classic aviations call for Maraschino liqueur which we’ve replaced here with the Combier Pêche de Vigne. I’ve also substituted Bols Genever for the more common gin. Genever is gin’s predecessor and it’s flavour is probably more akin to the first Aviation ever made. Be sure to shake the cocktail well and top it with a long lemon twist. Procedure: In a mixing tin add your genever, Pêche de Vigne, Creme de Violette and lemon juice. Fill the tin with ice and shake vigorously. Double strain your mixture into a chilled martini glass.